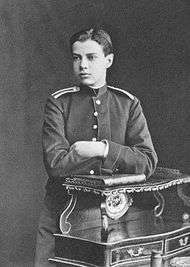 Grand Duke Vyacheslav Constantinovich of Russia, (13 July 1862 – 27 February 1879), was a Romanov grand duke and the youngest son of Grand Duke Constantine Nicholaevich of Russia and his wife Grand Duchess Alexandra Iosifovna. 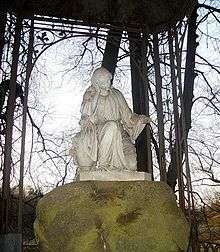 The English form of his first name is Wenceslas. Grand Duke Vyacheslav's monument in Pavlovsk. Vyacheslav, who was nicknamed "Slava," was the baby of the family and a family favorite. He was tall and used to joke that, when he is dead, his coffin would be stuck in a doorway of the Marble Palace. It really happened so when he died. At age sixteen, he complained suddenly of a splitting headache and violent illness. He lay with a Russian Orthodox icon on his pillow as his family surrounded him, urging him to breathe. He died within a week of brain inflammation. His mother later reported that she had seen the ghost of a white lady in the art gallery at Pavlovsk on the day before Vyacheslav became ill. She took the apparition as a portent of death. His brother Grand Duke Constantine Constantinovich of Russia later recalled, as he walked in Vyacheslav's funeral procession, how much Vyacheslav enjoyed drawing funeral processions in great detail. This article is issued from Wikipedia - version of the 4/4/2016. The text is available under the Creative Commons Attribution/Share Alike but additional terms may apply for the media files.